This hike takes you up to the series of lakes (Laux), well-known in Isère. The starting point of the hike has been changed for safety reasons. After Le Rivier, carry on along the road for around 2 km to the junction between the old road (now blocked) and the new, which descends via switchbacks to the valley floor. This is where the path begins, crossing the mountainside for about 1 km, before climbing tight switchbacks up the 7 Laux valley. Once on the plateau, the first lake you see is the Sagne. 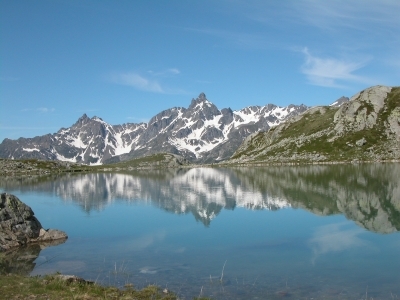 Walking along the series of lakes takes you from Oisans to Le Grésivaudan. There are plenty of chamois in this area, along with ibex, which were reintroduced in 1983 by hunters and the EDF when building the Grand'Maison dam. There are in fact 10 lakes in the 7 Laux, namely the Lac de la Sagne, Lac de la Corne, Lac Jeplan, Lac Agnelin, Lac du Cos, Lac Blanc, Lac Cottepans, Lac Carré, Lac de la Motte and Lac Noir.